Yesterday, when I went to pick Mouse up from school, my daughter greeted me with a huge grin and hug, asking me if it was a swim day, cheering when I said yes. As much as she loves her time in the water, getting her in her swimsuit and in the car on our way to the public pool is never a straightforward task. There is always something to do and friends to play with. To say three year olds are easily distracted is an understatement. The swim lessons are going well. She went from being the first to volunteer to jump off the diving board her first day three weeks ago, to being afraid to get close to it the next. Fortunately for all of us, last week, the little ones weren't asked to try. 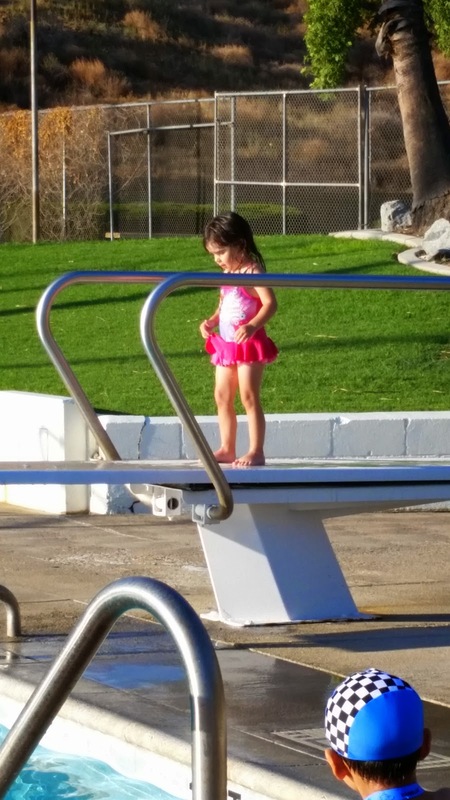 When her class of five beginning swimmers were marched to the diving board yesterday, my daughter, along with another boy, stayed back, clearly afraid. One of the instructors coaxed Mouse over and helped her jump off the diving board and into the arms of the instructor in the water below. Mouse was grinning ear to ear when she got out of the pool. She said she wants to do it again tomorrow (now today). She may feel differently this afternoon. I am still working extra hours at work, and it is wearing on me. I miss my family time most of all, but it is also leaving me exhausted, both physically and mentally. I am looking forward to my normal three day weekend coming up. I am finally at a place where I can slow down with the overtime and can settle back into a more normal routine. Mostly. All of this in preparation for my upcoming surgery, which will hopefully be in the late fall. In the beginning of June, I began working out every morning (five days a week) in an effort to be more fit, lose weight and to see if it would help ease some of the chronic pain I suffer from. I always balked at the idea of having to get up any earlier than I already do to get to work on time, but I finally reached a point where I decided it was worth a try. Trying to fit exercising into the evening after work is impossible, as much as I wanted it to work. Except for a the two days I skipped when I was sick and the one day because I hadn't slept the night before and decided sleep was more important, I have kept to my schedule. I am very proud of myself. It has not been easy, especially when my bed looks so inviting. I feel so much better though. There might not be any obvious changes on the outside, but I feel better on the inside and my pain has lessened considerably. I still have bad days, but I also have good ones--and that makes it worth it. Now to stay motivated . . .
One of the many things I like about reading is how it forces me to slow down a little. And, especially right now, I need that release. Every minute I get to read is a treasure. Fortunately, the books I have been reading have been worth treasuring too. I finished reading Countdown City, the second book in the Last Policeman Trilogy, by Ben H. Winters last week. I started The Book of Life, the final book in the All Souls Trilogy, by Deborah Harkness over the weekend, and finished it last night--it felt so good to immerse myself in Harkness's world. How I loved visiting with Matthew and Diana and all their family and friends again! Now I am back in that difficult but fun position of deciding what to read next. I am anxious to see if the world survives in Ben H. Winters' trilogy of which I have the final book, World of Trouble, but I am also curious about Yangsze Choo's The Ghost Bride, described by the publisher as "a startlingly original historical fantasy infused with Chinese folklore, romantic intrigue, and unexpected supernatural twists." Doesn't that sound good? At least I have narrowed my choices down to two this time . . . Ghosts didn't have much substance. All they were composed of was memories and heart. Atop one of Sept-Tour's round towers, [Name removed to avoid spoiler] pressed a diaphanous hand against the spot in the center of her chest that even now was heavy with dread. I have the first two.books in the All Souls Trilogy but I haven't managed to get around to reading them yet. I hope you enjoy the finale. Sarah - I have enjoyed these books quite a bit and definitely see a re-read at some point in the future. I have become very curious about this series...and even though this is not my usual read, I will have to explore! Enjoy...and thanks for visiting my blog. Laurel-Rain - It's such an interesting trilogy that mixes a few genres together. I like the world building in terms of the supernatural beings and the way she incorporates both science and magic into the book. If you do read it, I hope you will like it. Kelley - Me too! And it's so rare I read them right away anymore--which is sad. I am glad I didn't wait to read this one. I would keep reading. I hope you enjoy reading it. Maya - It was a very satisfactory ending to a trilogy I've come to love. I have the second book in the trilogy to read, and then will read this one. A bit out of my comfort zone, but I loved the first one. Enjoy reading. Rita - I really liked the first one too. I enjoyed the second one, but it took a while to get off the ground--still loved the historical aspects of it and the way the author handled the time walking story in. I've never read this series, but have been seeing The Book of Life everywhere lately. It doesn't seem like my cup of tea on the surface, but I'm curious about it since so many people seem excited about it. Yes, I would continue even though I haven't read the first two books. I have this book, comments, and reviews all over the place! I'm curious about it now. Pooch - I enjoyed the trilogy very much and can't wait to see what the author comes up with next. I haven't read this book or series, but I've heard many good things about it. Yvonne - I really like it! I get up early to walk every day and, some days, it is so hard to do. I had no idea you suffer from chronic pain but I'm glad to hear the exercise is helping. I enjoyed the first book in the series and hope to get to the second one sometime soon. I just loaned my ARC of the third book to a friend. Glad your daughter's swimming lessons and your exercise routine are going well. Enjoy the rest of the week and thanks for visiting my blog. I hope you have a great rest of the week too. I normally don't like series books but I do like that intro so I'm left curious for more. Congrats on the exercise routine Wendy. It's never been a top priority for me, but try for 30 min 5x a week and do feel better mentally - more energy too. Diane - On the plus side, it's a trilogy, so there's only three books in the series. Thanks for your kind words! I have always been bad about fitting in exercise. I always have some excuse not to do it. When my motivation starts wavering, I remind myself of the good it's doing for my body and my mind. Yay on Mouse's approach on the diving! She's definitely much braver than me, lol. I think it's great that you find some time to exercise! I tried jogging over the weekends for a while but my motivation just wear off as the time goes. It doesn't help that weekends are also my busiest moments but I guess that's my little excuse, lol. I loved the sound of The Ghost Bride; I hope my copy will arrive soon! I started The Ghost Bride yesterday during my lunch break and am really liking it so far. I'll be anxious to hear your thoughts on it when you read it, Melody! I deal with chronic pain too and find that if I exercise consistently, I feel better. I just recently added bike riding. Continued success on your goal! I have not read this series yet, but now can read it straight through! With the cliffhanger endings, reading all three once they are out is a good idea. :-) I hope you enjoy the All Souls Trilogy if you do read it. I'm definitely interested in the Harkness trilogy! It's on my wishlist. That's great that she's loving swim lessons even though she's not as fond of the diving board. Congratulations on working out regularly! It's hard especially when you have so much on but it definitely makes a difference. I think it helps with just about everything from stress to helping heal injuries. Katherine - I've enjoyed Harkness's books overall and hope you will too! I hope your days get less stressful soon! I know how those long workdays can be like. At least there is a three-day weekend to look forward to! I hear what you say about reading. Even five minutes of reading on a very busy day can be rejuvenating! Athira - Thanks! I hope so too. I think it's a combination of a lot of things and it will be nice when things settle down--like after I have the surgery and don't have to worry about everything leading up to that! Yes, even five minutes of reading can be refreshing. I often joke that I suffer from withdrawals if I don't get my reading fix in every day--but it's true in a way. Kudos to Mouse for her courage in going off the board, even though it was in the arms of her instructor. :-) And I am glad she has such a nurturing instructor. I really miss those "little years" with the kids, even though I remember that they were sometimes exhausting. I am sorry about the excessive work hours -- I hope things balance out soon. And congratulations on carving out a little time for reading and exercise! I like the excerpt you posted. Maybe I will add the All Souls trilogy to my list. Irene - She's so funny. Every time she's gone off the board, one instructor has had to get on the board with her and kind of push/drop her into the water to the instructor waiting in the water. None of the children in her class are able to swim on their own yet, but the staff like to let the kids get that diving board experience anyway. I was offered a couple more days of overtime this next month and I held in a groan. I will probably take one of the dates being offered, but I'm not excited about it. Brave little Mouse! Quite an accomplishment for her! I'm glad that working out has improved your circumstances, Wendy. Hope you can find the time to relax and let work thoughts go--your job requires a great deal of mental and emotional stamina. I am looking forward to the weekend. Just have to get through today. My mom gave my husband and I a really nice glider for our porch and I haven't yet had a chance to break it in--that's my plan for this weekend. I hope your days get less stressful and painful and you find time to relax. I know how hard it is to work so hard and miss family. It's always a juggling act it seems. Good luck with the working out, I hope it helps things. Running and reading are my stress relievers, and crochet too. And Mouse looks like she's enjoying the swimming and being brave. Naida - Thank you! It's kind of funny, but even though I have been working a lot more than usual, summers are generally slower for us work wise--and that's held true this month. So, in that way, it has been better than it could have been. I don't know if I will ever try running. I've never enjoyed it and right now I can't even think about it--my doctor advised against it until after the surgery--but I admire those who do enjoy it and can find release that way. My brother is a runner and my husband is doing the Couch to 5K right now to try and get in shape. That seems like a good program--really eases a person into it. Mouse does love water. :-) I think we are done with swimming lessons for the summer though. She'll be disappointed, but she's also showing signs she is done with it. If I'd been smarter, I would have skipped a session in between the two sessions she's attended. That would have given her a break. Oh well. Lesson learned for next time. I've never understood why they try to get such young kids to jump off the board. My thought is that you don't want them to think that they can just jump in water and everything will be fine! Lisa - I think it is some sort of right of passage for those taking swim classes. I remember having to do it when I was taking swimming lessons as a child too. I found it more traumatic than anything else. I hated having to jump off the board. I can't believe it's Friday, and it's the first time all week I've had a minute to read blog posts! Work has been crazy for me too, and I doubt it'll get better until after Labor Day. Anyway, I'm glad to hear that Mouse's swim lessons are going well and that you've been working out (thanks for the motivation! I need it!). I haven't had much time to read this week, and so I'm slowly making my way through Susan's Dennard's book about zombies that it's really intended for people much younger than I am (unrelated to my age, I have no ability to remember the novel's very generic title). So far, I like it, but not as much as I liked the first one in the series. A.M.B. - I hope you are able to find some down time even as busy as you are! I didn't get any reading done this weekend. :-( I was hoping to make a good dent in my current book, but no such luck. I haven't read too many books about zombies and hope you enjoy Susan Dennard's book. Glad to hear Mouse is doing well, a good idea to start early. Your routine does sound exhausting but on the exercise front keep it up :) It'll be worth it in the end. I'm reading a tour book at the moment and it's okay but I wouldn't recommend it. The Harkness I would read as I've been meaning to get to her books for some time, the usual story! Charlie - We're skipping this session of swimming and I'm not sure if I will sign her up for the final one. As much as she loves the water and is not happy she won't be taking part in lessons this week or next, she really was becoming a handful towards the end. I'm happy with her progress though and think she'll be able to progress to the next level next summer. I'm sorry you aren't enjoying your current read more. Hopefully it will pick up for you. I'm fascinated by my current read. If it continues the way it has been, it might end up being a contender for my favorite book of the year. It's still really early to tell though . . .
Alice - Thank you! Today was one of those more difficult days, but I still managed to get my workout in. I'm definitely noticing changes, even if not in my body like I would like to. It's a start, right? Just got to keep it up. I think it's wonderful that you are learning another language. I admire anyone who is able to communicate in multiple languages.